Vultures Row | Anytime Baby! For the past 2 years as the sun was setting on the iconic F-14 Tomcat, aviation photographer and author Erik Hildebrandt had been capturing the final defining moments of the remaining seven F-14 squadrons in the US Navy Fighter community. Anytime, Baby! 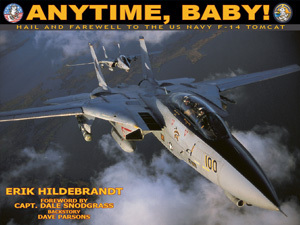 is an unforgettable collection of final phase TOMCAT milestones captured and preserved forever in some of the most detailed and dynamic photographic compositions ever attempted. Unprecedented inside access to multiple air-to-air photo missions with forward deployed combat units in the Arabian Gulf inlcuding VF-31 only one week before the last ever Tomcat combat strike mission into Iraq.